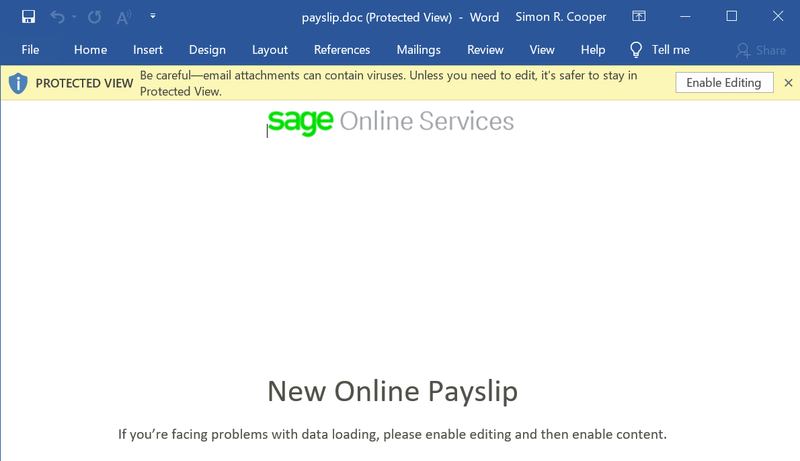 The sircles IT blog | Alert : New Online Payslip - Spam Warning !! 💰 Support - Can Bitcoin make you a millionaire? - SPAM WARNING !! | Inquiry - Spam | I will like to make a quick inquiry, kindly check attachment for details. Watch out for this email - it is an attachment scam but it does look convincing nonetheless. We are not running the macro to see what it does but do be sure to remain safe and not test it yourself. Report their email address as dangerous and inform Sage by email, especially if you are a customer of theirs. SageOnlineServices.co.uk has a full SPF record to protect you from spam so if your email provider is correctly using DKIM or SPF you will not see this message.